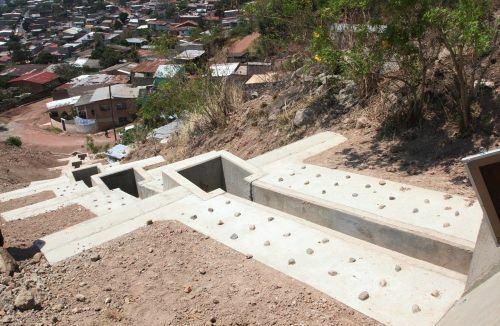 TEGUCIGALPA, Apr 1 2013 (IPS) - In slums lining several hillsides in the Honduran capital, mitigation works are under way to protect the neighbourhoods from flooding and landslides, which completely obliterated several areas when Hurricane Mitch hit the country fifteen years ago. Tegucigalpa, which covers nearly 1,400 square km and is home to over 1.3 million people, is one of the areas of Honduras most exposed to natural disasters. Geological faults have also been identified in some hillsides surrounding the capital, threatening the neighbourhoods on or below the hills. In 1974, 135 neighbourhoods were highly vulnerable to the effects of extreme natural events, but today 300 neighbourhoods – a large proportion of the capital – are at risk, according to a study carried out two years ago by the United Nations and the architectural association of Honduras. The report warns that urban sprawl will continue, requiring a map indicating the places where it is safe to build in the capital city of this impoverished Central American country of 8.3 million people. In March, the Tegucigalpa city government presented a plan for 100 public works projects to mitigate the effects of natural disasters, to benefit more than 154,000 families in 70 neighbourhoods. But it has not yet managed to implement the urban planning programme due to lack of funds. However, three major natural disaster mitigation projects are already moving ahead, with foreign aid. After Hurricane Mitch wreaked havoc in Honduras and neighbouring countries in 1998, the Japan International Cooperation Agency (JICA) conducted an environmental study in Tegucigalpa which found that top priority should be put on the high-risk areas of El Reparto, El Bambú and El Berrinche, poor neighbourhoods in hilly areas of the capital. Stabilisation works aimed at preventing landslides along a fault line in El Bambú were completed in 2012. The project benefited 50,000 people, and similar efforts are under way in the other two high-priority districts. Work on the stabilisation of El Reparto, a high-crime neighbourhood of 8,500 people on a hill to the east of the city, continues under a scorching sun whose effects are aggravated by the burning of forests in the area. The project was launched two years ago by the city government with support from JICA, which donated 13 million dollars for the works in the neighbourhoods highly susceptible to landslides. “We feel safer with these works – the earth doesn’t move as much as before, and when the heavy rains come, we don’t have the mudslides we used to have,” said Magdalena Flores, taking a break from selling fruit at her roadside stand to talk to IPS. Japanese technicians are building channels to carry underground and runoff water to specially constructed wells, in order to prevent the saturation of the ground and subsequent landslides. As part of the landslide prevention efforts, which should be completed by the middle of the year, local residents tend the early warning systems that include inclinometers, pluviometers and other soil motion sensors connected to red warning lights. When the work began, “you would drill four metres down and find water, which showed us that the water table level was very high,” the assistant manager of the Municipal Development Committee of the capital, Julio Quiñónez, told IPS during a tour of the area. But now, “with the mitigation works, we don’t find water until 12 metres down, which reduces the risk,” he said. Projections indicated that if the works didn’t start in El Reparto immediately, the makeshift homes lining the hillsides would be swept away by a landslide, collapsing onto neighbourhoods located downhill, and even onto theatre and diplomatic districts. El Berrinche, on the northeast side of the capital, was facing a similar situation. Mitch completely swept away La Soto, a poor neighbourhood on a slope that has been declared uninhabitable by the local government. Some 750,000 cubic metres of sediment were removed from La Soto and eight drywells were built to soak away the underground water, stabilise the soil, and avoid new mudslides and rockslides that could have dammed up the Choluteca river, which runs across the city from north to south. Once the works have been finalised in El Berrinche, an embankment will be built as protection against landslides. The embankment will also be used as a soccer field by the neighbourhood.